Second video for this busy day, shorter, which presents the support of e-paper screens from Pervasive display via Embedded Artists adapter board for our GPIO Demo module or our LPC1224-BreakOut board. Both images or in the micro-controller flash memory, and the text is displayed when it is received on the serial line (USB-to-UART). Pressing the user button switches the images and then restores the display of the text. Text display is made using partial screen refresh. At first, we will spend time on writting the documentations for yet undocumented products (RF module and DTPlug), both as PDF and on the Wiki, and then on adding examples and software support for all of our products. At the same time, we will go on with the development of the KNX, 1Wire modules, and start a few other modules : CPL (Power Line), BLE (Bluetooth Low Energy), and 2.4GHz RF for support of the 6LowPAN protocol. Each module should come as USB, UEXT and standalone as for the RF-Sub1GHz module. For the most curious of you, the other project we worked on last year was a car system and animation system for Mini World Lyon. We will create a one-pager to showcase what we did, and try to sell the result either as a whole, or by ourselves, which would need some more time to create end-user oriented versions of the system, as the customer decided to keep a simple licence rather than buy the whole intellectual property. As we promised to you, we managed to close the next paper soon enougth to get it in Open Silicium #14 ! It should be available in your favorite book store in a few days (in France). If not, consider fiding a new favorite book store ! 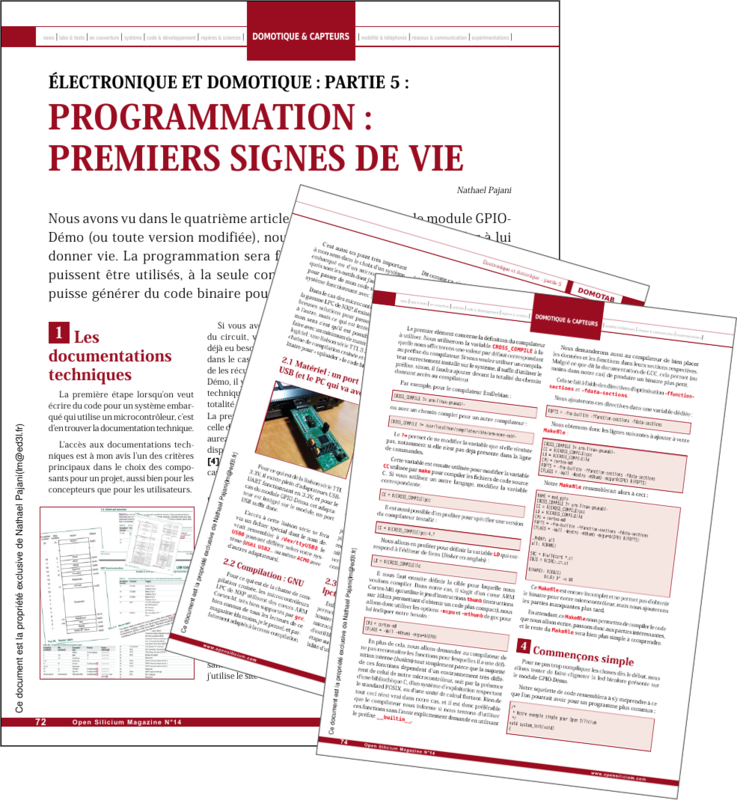 Much more than a guide to GPIO Demo module programming, you’ll find a step-by-step how-to which will guide you to the depth of these small black chips you can find in an ever-growing number of everyday-life items. Don’t wait for them to crush you, get ready for the trip and understand their deepest internals to master them and get the most efficient code for your projects. This new year brings good news ! First, we lowered most of the prices on our products. Have a look to our store. This is mainly an adaptation to the market prices, hopping it will help us sell more. We also put our new RF-Sub1GHz modules (868/915MHz) in the store. These are available in three declinations: UEXT for the DomoTab project, USB for development or use from any device which has USB host ports, which opens many other use cases and makes debugging easier, and last but not least, the standalone version, which can be powered from a simple AAA rechargeable battery (or anything above 0.9V, so some simple small photovoltaïc cells may do, to be tested). For those interrested in the LPC1224 micro-controller but do not care about the UEXT connector or DomoTab modules format, the new LPC1224-BO development board is now on sale. It’s a simplified version of the GPIO Demo module. Another piece of news which should make many of you happy: some of our products are now under CC-by-sa licence. This change affects the GPIO Demo module, the brand new RF-Sub1GHz modules, and the LPC1224-BO development board. We launched (at least !) our wiki, though there’s not much there yet (appart from the previously published papers for Open Silicium, and mainly in french, but we will add content in the upcoming weeks and translate what is already there. And last, for those interested in the micro-controller software, sources for our modules have been re-organised so that support of new modules and exemples for existing ones is easier (using git branches for each module, easily sharring common code). 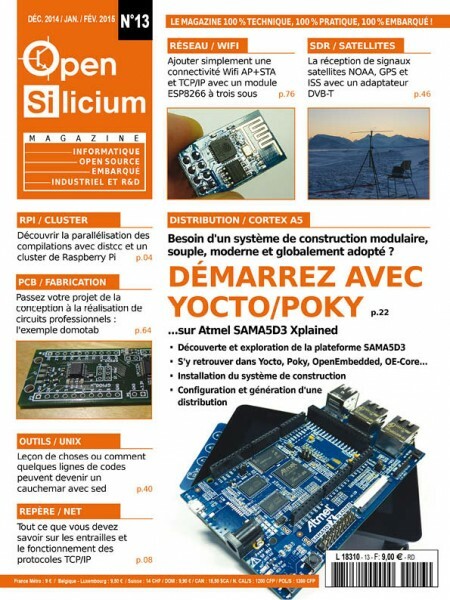 The fourth part of the paper series on the making of of the GPIO Demo module for the DomoTab is published in Open Silicium number 13 ! One year has gone since the previous one (sic) but you now have all the keys to get from design to production with professionnal-like quality while keeping costs very low and with very limited tools. I give you my word, we will not wait that long for the next one, and programming your micro-controller from scratch will become as easy as your daily programming tasks before summer ! We told you about our new idea: smart control. English version on air ! Our website is under translation, and as most of the content is translated, we activated the links between both versions. You’ll certainly see a few mistakes, as even if we asked some help from my cousin who speaks english quite well, we translated some pages on our own. Thanks, and have a nice time discovering our project ! We just received yesterday a new processor module for the DomoTab, with modifications to the DDR3 bus routing and this time DDR functions seamlessly. I can’t tell you more about it yet, I’ve got to test everything else and there’s a lot of stuff around this module so it’s gonna take some time but at least I can get started! LVDS interface for screen on tablet version. Power on micro-USB connector or JST 2 pins connector. ARM JTAG 20 pins connector (unpopulated). Wifi and Bluetooth will be available using a Wifi/Bluetooth USB key. Tablet version available with 2Mpixels autofocus Webcam (over USB), and 10″ screen (standard version) or 7″ stereoscopic screen (gamer version). DomoTab is an open source, multi-protocol domotics central unit (smart home brain) and is the result of the DomoTab project. This central unit comes in different variants but all have in common two elements, two circuit boards created to answer any and all smart home needs. One supports the core components, CPU and memory, and the other serves as the docking board and sports all the connections. DomoTab has all the connections you would find on a laptop (USB, Ethernet, audio, video, SATA, Express-card and SD card reader) as well as four module slots with which you can add any functionality you need. This modular design allows most smart home protocols to communicate and interact. This means DomoTab can be integrated in a set up where several protocols are used or allow you to set up an installation from scratch without having to worry about compatibility and at the best value. Electronic boards only: if you don’t want the constraints or the cost of a more advanced option. Box version: if you want DomoTab to blend into your multimedia installation without having to camouflage all that circuitry. Basic Tablet version: so you can benefit from the convenience of today’s tactile screen tablets without the limitations. Contact-less tablet version: for those who want to operate controls without touching the screen, very handy for cooking or DIY. Gamer version: for those who want to stay ahead of the game and have one of the first full 3D tablets with stereoscopic 3D screen and nemopsys 3D control interface. And all that with the unmatched freedom of having all the technical data and documentation freely available (DomoTab is under Creative Commons license).